Thirty seven percent of British workers think their jobs are meaningless, according to a YouGov survey, which is a really shocking statistic if you think about it. In my article, The Campaign for Meaningful Work, I shared some thoughts on the ‘why of work’ and the flaws with our past initiatives around improving employee engagement. In the absence of a strong causal link between engagement and productivity, my ‘hunch’ was that ‘meaningful work’ is important for our own personal sanity and well-being. How can organisations provide work that is meaningful? There are different ways of responding to this question and one source of evidence is to look at the scientific research. I recently met up with Katie Bailey, Professor of Management at the University of Sussex to discuss her research on Meaningful Work. A quick review of the scientific literature shows that there is surprisingly little research which explores where and how people find their work meaningful. As part of the research the team interviewed 135 people working in 10 very different occupations (retail assistants, solicitors, nurses, soldiers, stonemasons, street sweepers, entrepreneurs, priests, artists, writers and academics). The group was asked to tell stories about incidents or times when they found their work to be meaningful. According to Katie, “the overwhelming majority of people seem to find meaning in at least some aspect of their job. In fact, 86% of people said that their jobs were meaningful”. The team found that there were patterns of work from their research which they categorised as five qualities of meaningful work. 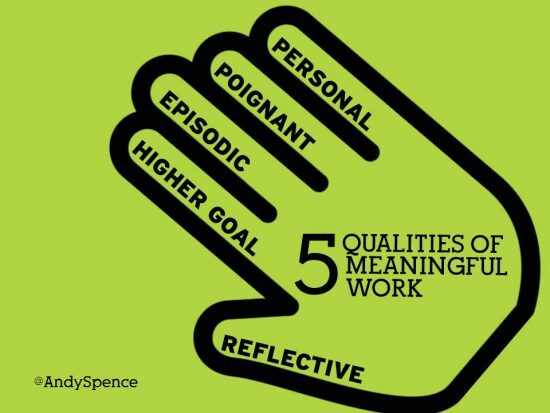 People are more likely to view work as meaningful when it mattered to others more than just to themselves. From the interviews, an example is the garbage collector who found work meaningful at ‘tipping point’ at the end of the day when refuse was sent to recycling. This individual could see his work contributed to a clean environment for his grandchildren. Meaningfulness is not always a positive experience. We don’t walk around in a euphoric state all day at work. For example nurses use their skills to ease the passing of patients at the end of their lives. Meaning can come and go during the working life, rather than an everyday occurrence. For example, the lecturer “feels like a rock star” after delivering a good lecture, or the stonemasons leaving their mark into a stone that might be discovered in hundreds or years. Meaningfulness was rarely experienced in the moment, but rather in retrospect and on reflection when people were able to see their completed work and make connections between their achievements and a wider sense of life meaning. One academic talked about research he had done for many years that seemed fairly meaningless at the time, but 20 years later provided the technological solution for touch-screen technology. Work that is meaningful, on the other hand, is often understood by people not just in the context of their work but also in the wider context of their personal life experiences. An example was an entrepreneur’s motivation to start her own business included the desire to make her grandfather proud. So, what insights can we elicit from this research? First, it emerged that the individual feels that they have done a good job and therefore experience a sense of achievement or pride. No one said to us, “Hey, I did a really poor job today, but it meant a lot to me.” For example, the street cleaners talked of looking back along the street they had just cleaned and feeling they had made an important contribution to the neighbourhood. The stone masons explained that they found their work meaningful when they had successfully completed an intricate carving. Secondly, in most cases it was important that the individual could see they had contributed to their team, other individuals, or a wider cause. Some talked of the importance of a sense of camaraderie or belonging, others talked of times they felt recognised or valued by clients or the public. For instance, the retail workers talked of helping vulnerable elderly customers. Finally, the times when people found their work meaningful were often intensely personal. One entrepreneur had started her bakery business to make her grandfather proud of her. A hesitant author was emboldened to embrace her craft following a chance encounter with another customer in a stationery shop who assumed she was a writer. A soldier talked of the importance of her family being present at a dinner held to celebrate her military service. Over the years I have shared my ideas about making work more meaningful, including linking the work to something bigger, empower people to organise their own work and ditching that annual engagement survey. If you really want to understand what employees think about their job, then ask them. “Feedback is the killer app” for management, as Josh Bersin says. New technology makes this possible whether using pulse tools or analysing responses to open questions such as Workometry. For those who are involved in designing new organisations, managing teams or implementing digital transformation initiatives, then understanding which features makes work meaningful for people is important. You might also find this article of interest, "The Seven Deadly Sins Preventing Meaningful Work". Hopefully we will see more workers finding meaning in their work in the future. I am looking forward to seeing how this fascinating research area develops. This entry was posted on Friday, May 19th, 2017 at 11:40 am	and is filed under Change Management, Employee Engagement, Future of Work, HR Blogs, HR Strategy, Meaningful Work, Productivity, Talent Management. You can follow any responses to this entry through the RSS 2.0 feed. You can trackback from your own site.